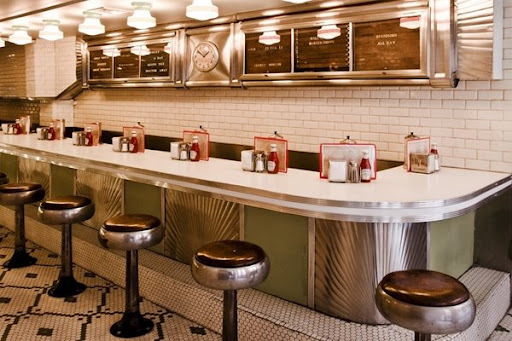 Wall Street can use a bargain lunch these days.The Burger Shoppe– which is infamous for its $175 Kobe beef burger topped with truffles, foie gras and the lamentations of the downtrodden- also serves a bargain lunch, at least by New York standards. For $4.50 you can get their Shoppe burger, a cheese burger with their house sauce and lettuce. I opted for some dressed-up versions and a mix of fries and onion rings. They have some excellent microbrews on tap, including Sixpoint Righteous Rye. 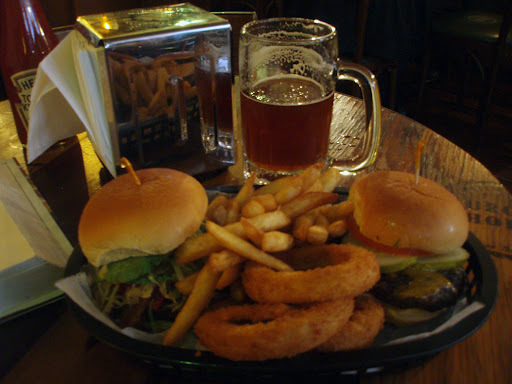 I had one with my burgers, and enjoyed the old world feel of the aged bar room upstairs. Downstairs is a chrome counter top with stools, recalling lunch counter days, but I wanted to try their Bar Room Burger– $18 worth of beef topped with aged Gruyere and braised pork belly- so I headed up the creaky steps to the darkened bar room, and grabbed a round table for myself. Well, unfortunately they only serve that burger during dinner hours, so I grabbed a Kahuna burger (muenster, avocado, bacon) and a Becky (aged cheddar, pickles, ketchup). Their All-Day Menu has some other choices, like the timely Sub-Prime Meltdown (swiss, mushrooms, onions) a Crispy Shrimp burger, a chicken burger, and a portobello mushroom burger for you veggie types. The burgers are pretty good, good taste and not too big. Two is an easy meal. Their fries and rings are tops, good flavor and crispy, not greasy. The toppings seemed to overwhelm the beef flavor, so next time I’ll make sure to try a Shoppe burger alone. As it stands, they’re hovering around Five Guys Burgers & Fries in my rankings, but I assume their Bar burger will be in higher territory. But the place is about atmosphere. 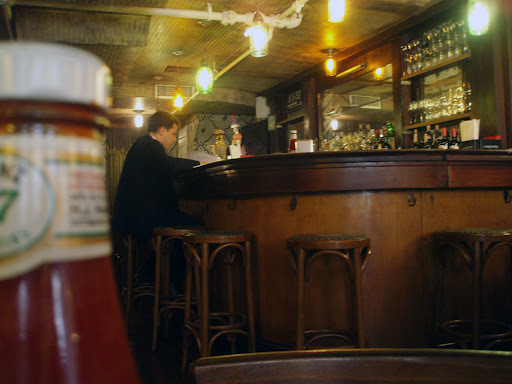 I love an old bar room, and the aged wood scarred from years of stockbroker elbows leaning heavily upon them, gives the place that old New York feel you get in other classics like Chumley’s. And their beer selection lives up to the image. If you’re way downtown and want a burger, but not Bourdain’s $15 jobber (worth every penny) at Les Halles, grab a stool or a table at The Burger Shoppe. And if you shorted the market, buy the $175 Kobe/truffle/foie gras one. But if your portfolio puts a tear in your beer, you can still grab a tasty bite here.